The Associazione promotes and perpetuates the finest of Ligurian customs, traditions, history and culture. Become a member now so you too can attend some of our upcoming events! Don’t miss the events we are planning for 2019. We are Liguri, or commonly thought of as Genovesi. Our wish is to provide you with interesting items and tidbits about our extended Genovese family, people who at one time were part of La Republica di Genova and now are in or from the region of Liguria, Il Basso Piemonte, parts of the provinces of Pavia, Piacenza and Parma. THE SWAN, il cigno, the symbol of the Liguri Nel Mondo, has always been linked to Liguria. A fable from Greek Mythology tells the story of Cygnus, the King of the Ligurians who, while grieving over the death of his friend, Phaeton, was turned into a swan, Cygnus. The unlucky king in his new form became the emblem of the region over which he reigned, Liguria. The Encyclopedia Britannica has the following under Ligurian: Latin Ligus, or Ligur, plural Ligures. Any member of a collection of ancient peoples who inhabited the northwestern Mediterranean coast from the mouth of the Ebro River in Spain to the mouth of the Arno River in the 1st millennium B.C. The Ligures were ancient people who gave their name to Liguria, which once stretched from Northern Italy into Southern Gaul. The Ligures inhabited what now corresponds to Liguria, Northern Tuscany, Piedmont, part of Emilia Romagna, part of Lombardy and parts of southeastern France. Since the great time of America’s discovery, some fifteen generations of Ligurians have emigrated to all parts of the world, carrying with them a longing to bestow pride on their homeland through their accomplishments in a new land. While living and working in their respective new countries, Ligurians have never lost the drive to remain close to the traditions and customs of their homeland, Liguria. 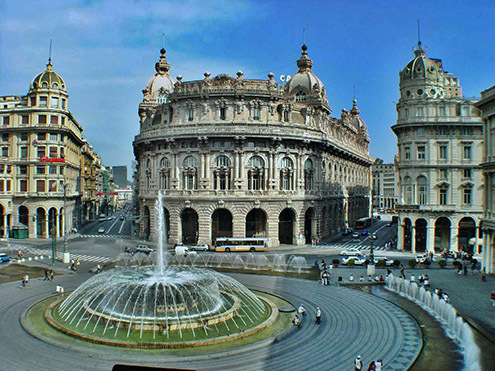 It is for these reasons that the Associazione Liguri nel Mondo (Ligurians in the World Association) was founded in Genova, Italy. Its chief purpose being to bring together all Ligurians throughout the world in order to re-establish closer ties with their Ligurian heritage. The Associazione promotes and perpetuates the finest of Ligurian customs, traditions, history and culture. Today there are eighty-two chapters in more than thirty countries around the world. The San Francisco Chapter of the Associazione Liguri Nel Mondo was founded in 1987. Over the years, through your kind generosity, we have been able to provide scholarships to deserving students who take pride in their Italian heritage. While renewing your annual dues again this years, please consider a tax-deductible donation to the Scholarship foundation. Do us a huge favor and help us continue to award these scholarships by making your separate check payable to Liguri Nel Mondo scholarship Fund, which assures the tax deductibility of your donation. Send your check along with your dues renewal check. The Mission of the Associazione Liguri Nel Mondo foundation is to reward graduating high school seniors of Italian decent who will be attending college and have excelled in academics, demonstrated service to their community and school, are proud of their Italian heritage.